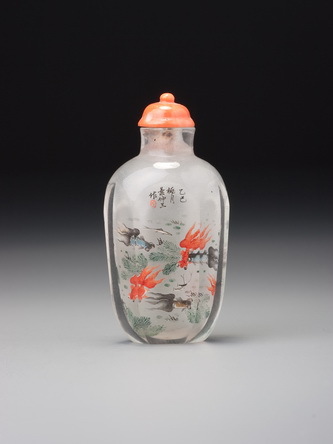 While there are a number of reasons for attributing this bottle to the court, and to the mid-Qing period, we have discreetly avoided a direct attribution. 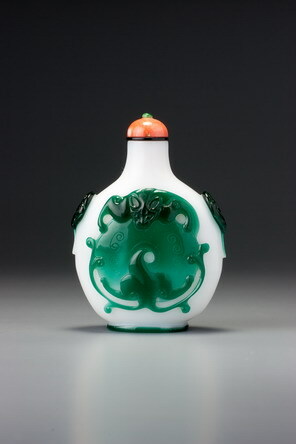 Chi dragons in general were among the most popular of courtly designs on snuff bottles, and archaistic motifs of this sort were a particular favourite of the Qianlong emperor. The bi disc, a symbol of heaven, figures frequently both on ancient objects in the Imperial collection and as a decorative motif on Imperial works of art from the Qing. The materials are similar to many other examples that can be attributable with some confidence to the Imperial glassworks, and the mask-and-ring handles also fall within the typically courtly range of styles. There is perhaps one hint of innovation suggesting the desire to enliven a standard depiction, however, in that the upper body of the beast is carved so that it doubles as a bat. Likewise, the head of the dragon has been carved in an unusually bat-like manner, with forelegs carefully positioned and detailed to resemble folding wings. We cannot deny the possibility, of course, that this is no more than a coincidental similarity arising from the rather formal disposition of the beast. Another example of a similar design is found on a white-on-blue overlay in the Chasin Collection ( JICSBS, Summer 1993, front cover), but it displays not even a passing resemblance to a bat. The generous size may also indicate a mid-Qing date, as may the fact that the both the ring handles and footrim fall well short of the ideal match of colour to design. The use of different thicknesses in the overlay is a part of the considerable appeal of this imposing bottle and those differences are enough to create an effect akin to that of a double overlay, despite the absence of a third layer of different colour.